There is just nothing quite like the sweet taste of homemade marshmallow treat bars. They are one of those deserts that you can easily change up to fit any occasion. Making a Valentine’s Day treat? Add red food coloring and chocolate chips. Need a last minute Christmas dessert for a family get-together? Mix in some sprinkles and stack them in the shape of a Christmas tree. The variations are truly endless! With St. Patrick’s Day this week, try out this easy recipe for a super fun take on this classic family favorite. The kids will love to help make them too! 1. Melt the butter in a sauce pan over low heat. Add the marshmallows, and mix until smooth. 2. While the marshmallows are melting, pour the marshmallow cereal into a large bowl. Sort out all of the marshmallow pieces and keep to add to the mix later. 3. Add a few drops of green food coloring to the butter and marshmallow mixture, and stir until it's well blended. 4. Add the crispy rice cereal, a little at a time, mixing until the marshmallow mixture coats the cereal. Remove from heat. 5. Add the marshmallow cereal pieces to the mix. 6. Grease a 13x9 inch baking dish with cooking spray, and spread the mix into the dish. 7. Allow to cool completely before cutting into squares. It’s as easy as that! Take some time to make the holiday special, and be sure to explain its true meaning to your kids. 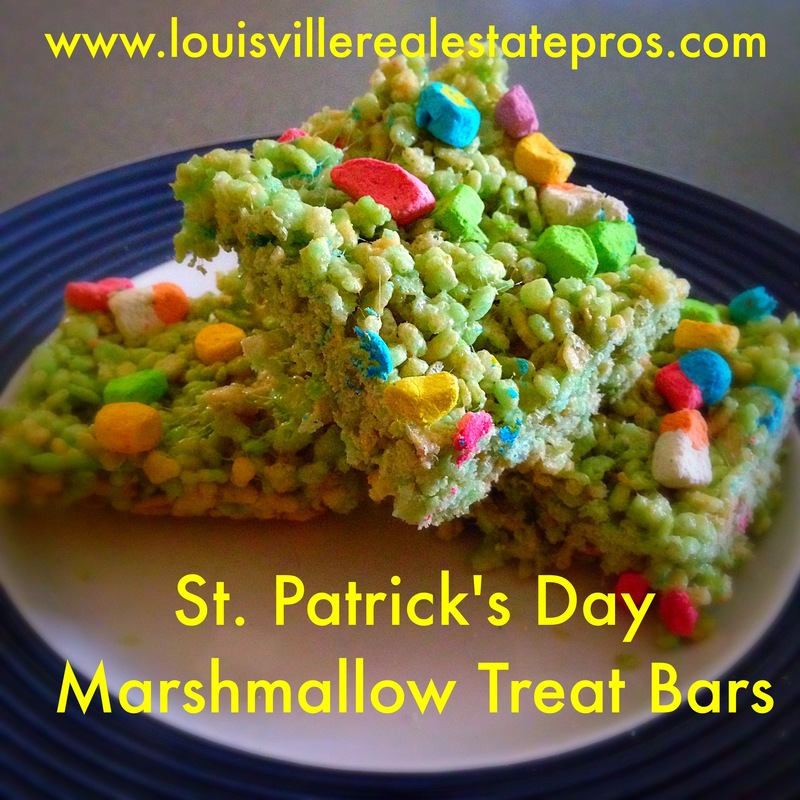 Besides, what’s a better than celebrating St. Patrick’s Day all week long with festive marshmallow treat bars in your lunch box? Looking for a realtor in Louisville, KY? Contact Pam Ruckriegel with The Louisville Real Estate Pros at Keller Williams Louisville East. 502-435-5524.